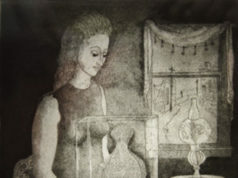 At the gallery’s Third Annual Regional Juried Exhibit, explore a range of work. And tastes. Marilyn Waligore’s “Aluminum RG#1” won the top prize: $1,000 and an opportunity to participate in a solo or group exhibition in Artspace’s 2016-17 season. 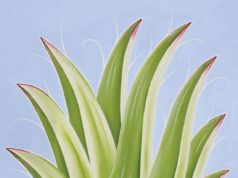 Artspace 111 is currently hosting its Third Annual Regional Juried Exhibition, a six week-long show featuring 83 artists. The juror was Eric M. Lee, director of the Kimbell Art Museum, who also awarded various prizes. Marilyn Waligore’s “Aluminum RG#1” won the top prize: $1,000 and an opportunity to participate in a solo or group exhibition in Artspace’s 2016-17 season. 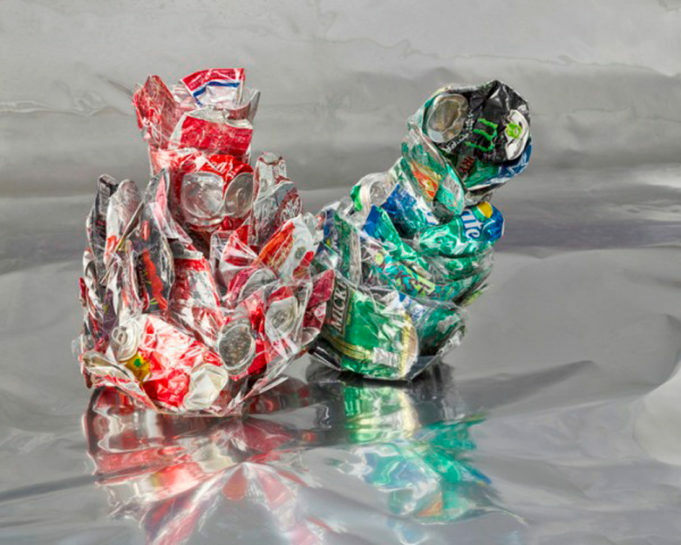 The archival pigment print (photograph) is a composition featuring two soda can sculptures fashioned into floral blossoms, shot on a glossy, reflective surface. Because of the reflections and the muted colors of the cans, which appear to be crushed and wrapped in cellophane, the image has the appearance of a painting. I was a bit disappointed when I realized it was a photograph, but I was also struck by the image’s ability to deceive me! 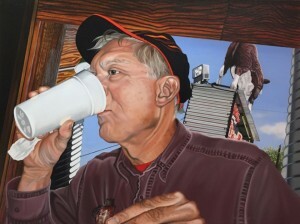 The juror’s two picks for best two-dimensional art went to Nancy Lamb and Robert Cook. Lamb’s oil-on-canvas painting of her late husband Bob Powell was aptly rendered in her signature style, capturing her subjects’ in Cartier-Bresson-esque moments and demanding closer scrutiny of the present. “Too Heavy on the Sauce” is a really beautiful painting, typical of Lamb’s moments that seem fleeting but, when seen collectively, really describe the characters worthy of her brush. Cook’s “Rooftops of Barcelona” watercolor painting shares a similar everydayness that resonates with viewers only when we are forced to look at art that pauses our daily grind to show us ourselves. T.J. Mabrey’s submission in marble and bronze, “Bearing Gifts II,” was one of a handful of three-dimensional works in the show –– sculptures were allowed for the first time this year. The work is a solid block of marble carved into the shape of a flower bud that opens into a mound that repeats the sculpture though smaller and in bronze, suggesting a crown. “Too Heavy on the Sauce” is a really beautiful painting, typical of Nancy Lamb’s moments that seem fleeting but, when seen collectively, really describe the characters worthy of her brush. Rounding off the highlighted art in the exhibit were three pieces selected for artistic merit: Kristin Kirkley’s photograph “La Caminata,” John Webb’s sculpture “Budapest,” and Joey Brock’s “Beneath 11,” a mixed-media submission. As with any annual art contest, the juror’s picks will usually vary from year to year, depending on who the juror is and their understanding of what merits an award. It can also reflect that person’s taste. Last year’s selections and winners, for example, reflected the sensibilities of the juror, mixed-media painter/sculptor Vernon Fisher. The top prize went to Kenneth Craft’s “National Park,” a combination of drawing, painting and text, a recipe that is a strong part of Fisher’s own work. I think this dynamic (the solo juror versus selection by committee) leads to a deeper understanding of the art process. We can learn how differently we perceive the world, but that singular view is often a strong opinion and can help to define the things that we connect to the strongest in the art that we love. The selection is also a reflection of the artists who applied –– after all, the juror can select only from what is submitted. There were some highlights worth noting. Shelby Orr’s “Trophy Room,” a 20-inch square archival inkjet print, is one. The mounted trophy head of a moose appears in the center of a black-and-white composition photographed in an office space. A bright light illuminates the frame, giving the space a creepy feeling, somewhere between Wes Anderson and David Lynch. 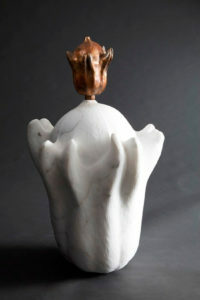 T.J. Mabrey’s submission in marble and bronze, “Bearing Gifts II,” was one of a handful of three-dimensional works in the show –– sculptures were allowed for the first time this year. And as long as we’re talking photographs that evoke film, we can walk out of Orr’s piece and straight into Paul Greenberg’s Kubrick-esque “Lights.” It is a really masterful gelatin silver print of the old school/darkroom variety in which the rectangular frame from an office space with disc-shaped ceiling lights is transformed into a mesmerizing out-of-space experience. After spending an hour in the exhibit last Friday, I could already see that my picks would have been a lot different than Lee’s, just as his were different than Fisher’s. I responded to the photographs the most intensely. And out of the reported 1,000 entries, my selections would have been very photo-heavy. Of the pieces selected, I kept going back to one show-stealer: Chris Ireland’s “Dad Standing in Front of Things 1943-1990.” It is a grid of 48 digitized Polaroid prints of the artist’s father … standing in front of stuff. It was easy to imagine how Ireland pored over of the images in keeping with his theme, meticulously arranging the progression of one mundane activity over the span of almost 50 years. With the bulk that comes with family albums documenting everything and the novelty of new technologies each generation, it’s hard to imagine more than a few images standing out. But what Ireland does here is strip away the novelty and give us what the photograph does best: make sense of moments over the span of time. Christopher Blay is an artist, writer, and curator with a BFA from TCU. His upcoming installation is a response to historical violence against African-Americans. Based on the fictional character KaraWalkerTexasRanger, “KWTXR” will be on display thru Aug 20 at the South Dallas Cultural Center. The opening reception is 4-6pm Sat, Jul 16.